Reaching accomplishment creek on the Sag River is indeed an accomplishment. Fully out Alaska’s snowy Brooks Range and into the seemingly endless arctic tundra. However, accomplishment and completed are not synonymous. Another very full day awaits – half on on whitewater and half in a car. But what better way to reward an accomplishment than Alpenglow reflected in a tranquil rock garden in a truly wild place. Fall and winter collide in the Atigun River Gorge. Sept. 2, 2017. It seems my life is being drawn toward rivers significantly more in recent years. I don’t necessarily go searching, but don’t turn them down either. Such a situation arose last fall, when I got the opportunity to float the Atigun and Sagavanirktok rivers. They are extremely remote class II-IV rivers, far above the Arctic Circle, flowing north out of Alaska’s Brooks Range. It’s a nine hour drive north from Fairbanks just to the put in — cell phone service is unavailable after about 45 minutes of driving. Don’t forget to add a few extra hours for the car shuttle. Needless to say, the trip is extraordinary. Today is (observed) Alaska Day. The official Alaska Day is Oct. 18 and recognizes the U.S. flag raising at Fort Sitka on Oct. 18, 1867. The U.S. flag replaced its Russian counterpart following the purchase of Alaska for roughly $7 million. Alaska Day is being observed a day late this year because it is a paid holiday for state employees. Since I didn’t post about it yesterday the observance also gives me another opportunity. It’s impossible to find one photo, or even a group, to represent all Alaska has to offer. 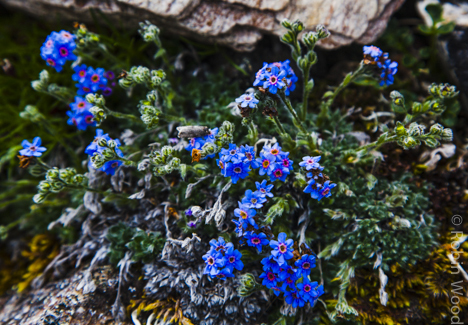 Instead I chose Alaska’s state flower: the forget-me-not. The tiny blue and orange flower is hard to spot, and equally difficult to photograph. My happy place is a state of being — the culmination of numerous factors. A breath of fresh air in sun or snow. Freedom to run through the woods, twisting along a skinny trail. A beer and a dance floor with great live music, or a slow sunday with a cup of hot coffee. Of course looking through a viewfinder is often a happy activity for me. 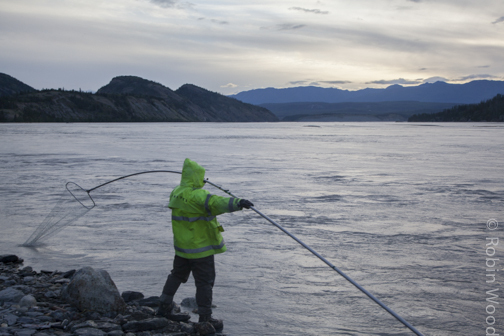 Above: Expect more of a “fishing perch” than a “fishing hole” when dip-netting the Copper River in southeast Alaska. Spirit Mountain pokes above the big and fast glacial-fed river that’s full of silt and very cold. 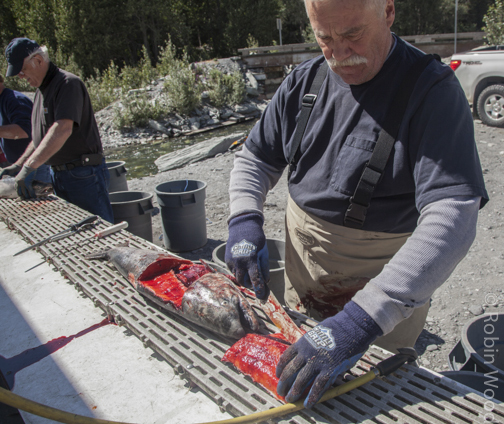 Copper River Reds, the salmon in the net, are some of the most sought after in the world. The river is also an excellent of the Weekly Photo Challenge of boundaries. Rivers are some of Earth’s most common boundaries. For the fish in my net it is a boundary of left and death, or for a person if they fall in. Sometimes sweeping is necessary — a time- and labor-intensive technique during which the fisher sweeps the net with the current, resets and repeats. Even when fishing is done much work is left to be done. Here a king salmon is butchered. Berry picking is a passage of fall, and provides delicious and healthy food for a long winter. Fall is a harbinger of winter, especially when snow begins dusting mountain tops. Forest fires are an important mechanism for regrowth in the boreal forest, and berries frequently find their nutrient-dense soil. Above: The University of Alaska Fairbanks’ Geophysical Institute, with a satellite-receiving dish on the roof, sits tucked among trees as a runner makes her away along trails far below, visibly only by a bright blue jacket. According to the Alaska Department of Fish and Game the boreal forest, that which is found around Interior Alaska, is largest terrestrial ecosystem on earth. Interior Alaska’s fall comes fast, and leaves even faster. With only a small variety deciduous trees we don’t get a large variety of color, but the bright yellow leaves among dark green spruce still make dramatic scenes. It can take less than one week for trees to shed their leaves if a hard frost is followed by a strong wind or rain. The Delta Clearwater is an Interior Alaska river true to its name: clearwater. An early summer float trip provided astounding views and some small wildlife. A sandpiper, a small migratory bird, feeds in the Delta Clearwater. Earlier this summer three friends and I took advantage of Alaska’s 24-hour daylight to night hike Granite Tors in the Chena River State Recreation Area. We started aaround 8:30 p.m. and finished the 15-mile loop trail around 3 a.m. We ran as much as possible of the challenging trail and took one or two snack breaks. Two benefits are immediately noticeable when night hiking. Catching spectacular sunsets and avoiding scorching mid-day heat. Two of my run hike partners descend toward some rock formations. Sweeping vistas are common in the Chena River drainages. During Alaska’s summer the sun often sets past midnight. This picture was taken around 12:30 a.m.
A forest fire scorched parts of the forest about 10 years ago. Above: Mt. Diamond backdrops Eli Sturm as he skies down a couloir in Thompson Pass, where the scenery and snow are world class. 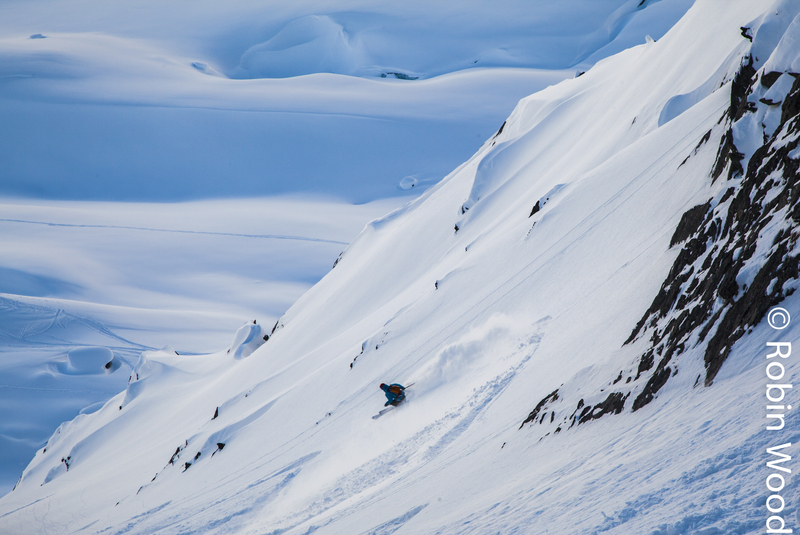 The 2,805 foot Thompson Pass pass is outside the coastal town of Valdez, and averages more than 550 inches of snow per year. Skiers and snowboarders travel from all over the world to make turns in Thompson. Copious runs are accessible right off the road, while endless mountains provide the potential for extended excursions. My friend Eli and myself made the six hour drive south from Fairbanks last Saturday for two very full days of riding. We mostly used climbing skins — directional skins you attach to the bottom of your skies to ascend mountains. On the first day we skinned about 4.5 hours, climbing roughly 4,000 feet, to the top of a couloir, a steep narrow gully on a mountain. The result was some of the best and most scenic riding of my life. Descending towards Diamond Glacier in Thompson Pass with spectacular snow. 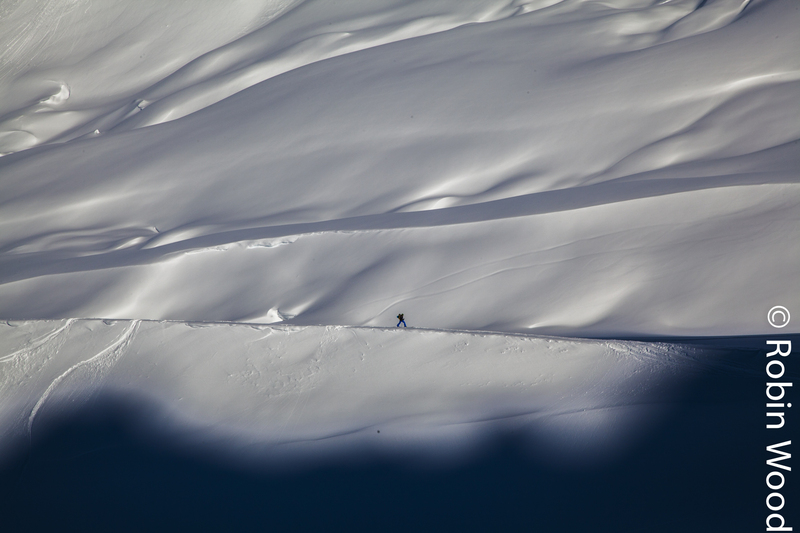 A skier traverses towards shade on the Diamond Glacier in Thompson Pass. Some time ago I realized I live in one of the most stunning landscapes on the planet, yet fail to truly experience it. I call it the backyard syndrome: it’s so close you rarely walk through it. Not to say Alaska isn’t enormous, harsh and challenging. So more and more I have been taking to the trail. A few weeks ago four people from the Alaska Alpine Club attempted to summit White Princess — a nearly 10,000 foot peak in the eastern Alaska Range. The 9 mile approach up the Caster Glacier took all day, but bluebird skies always make great skiing. Unfortunately, bluebird skies didn’t stick around, and near-whiteout conditions high on the mountain nullified Sunday’s summit push. Absolutely no complaints though. The photos are mostly 35mm film with two iPhone frames. Approaching an ice cave on the Caster Glacier, even simple Alaska scenery’s stunning. Inside the ice cave a person’s presence is easily overcome by time, textures and colors. Ski tracks say where you’ve been, and can be extremely satisfying to look at. The only view we got of White Princess — the peak in the upper-right quadrant — was rolling into base camp around 9 p.m. Dark and cold quickly followed. A large rock wall dwarfs skiers and illustrates the scale of Alaska’s environment. Group shot before leaving base camp. About the only blue sky seen on Sunday. Snow blowing off the ridge is a good indicator of the strong winds.